Apartment life in downtown Bethesda means inhabiting a spirited urban community boasting plenty of restaurants and bars. 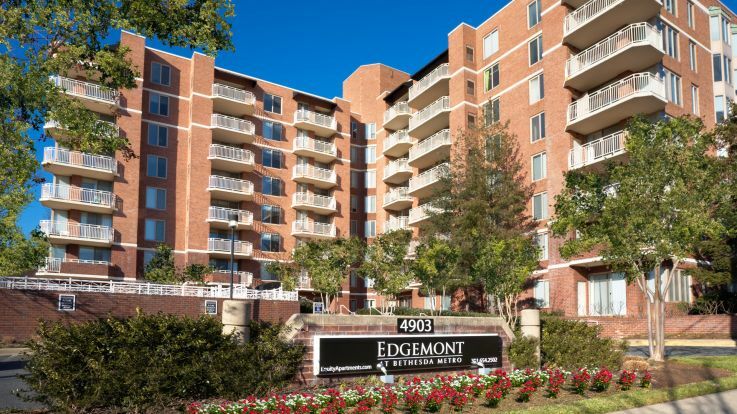 Situated in the heart of Maryland, Bethesda apartments are only a short drive from Washington, D.C., and are consequently popular with a wide range of people who work there. However, the community is far from being a mere suburb of the capital. Bethesda has some important national institutions in its own right. Organizations such as the Consumer Product Safety Commission and the Uniformed Service University of Health Sciences are located in this part of Montgomery County. The giant defense contractor Lockheed Martin also has its headquarters in Bethesda. In the census-designated place (CDP) of Bethesda there are some 75 fashion retailers, many of which are independent boutiques. The community is also home to two farmers markets where fresh produce can be bought directly. One runs each Sunday morning and the other is open on Wednesdays, Fridays, and Saturdays. The standard of accommodation in the community is high and Bethesda apartments offer some luxurious living, often in extremely accessible locations. The public transport links are good and it is possible to enjoy apartment life here without having to rely entirely on an automobile. Just nearby, there are a number of day spas and beauty salons. Bethesda boasts not one but three separate theaters which host some high-quality productions as well as live music shows. There are also a number of art galleries all within walking distance. In terms of dining, Bethesda is particularly well-catered. The cuisine on offer has a global flavor. Along with Italian and Mexican food, which you might expect in any American town of a similar size, there are Lebanese restaurants, Persian restaurants, and, represented along with Chinese and Indian, Thai and Vietnamese restaurants. You can also savor some European food at Flanagan’s Harp & Fiddle on Cordell Avenue or try British cuisine at Union Jack’s on St. Elmo Avenue. Tommy Joe’s Restaurant on Montgomery Lane is a good place to head for the best traditional American-style food. Bethesda’s community also holds plenty of special and one-off events. In any particular year, there are a number of projects to get involved with. In terms of performance events, there are occasional stand up comedy nights and dancing recitals. There are dance summer camps for kids and group foreign language programs for people of all ages. Bethesda also has events for anyone interested in book groups, poetry, and even yoga. The community really does have something to offer everyone.